Electrolux ICON Professional E23CS78HPS is a 22.6 cu. ft. Counter-Depth Side by Side Refrigerator with PureAdvantage Filtration Systems, Custom-Design Full-Depth Glass Shelves and Smooth-Glide Full-Extension Drawers, Ice and Water Dispenser. Stainless Steel finish. The Electrolux ICON Professional E23CS78HPS features the most advanced filtration systems available that offers fresher, cleaner air, ice and water. Also, transition lighting that is so thoughtfully designed that it gradually illuminates the interior of the refrigerator with soft but ample light. Designed to ensure the highest quality of food and wine preservation and water filtration, Electrolux ICON Professional refrigeration line is an elegant addition to any kitchen. For a touch of personal style, you can even customize the exterior to match your cabinetry. Pros: looks great fits wonderful in the counter depth. 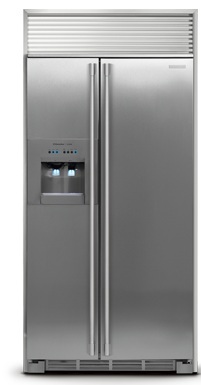 The first one that was delivered was a nightmare, doors did not close correctly (always condensate in the fridge) and the ice/ water dispenser did not work. Required two service calls into the house and multiple parts replacements and it still did not work. At this point Electrolux insisted one must have three service calls on a new machine before a replacement would be issued. After much talk by the service folks and myself Electrolux finally agreed to swap. The new one is completely different, doors seal tight, everything works. It's a GREAT item, just a shame that the first had as many problems as it did and it took several complain calls to Electrolux to get a replacement. I'd get another one again but would expect better quality for the price. I bought 7 Electrolux ICON appliances this past year. The refrigerator needed the air filter and water filter changed as expected in about 11 months. After replacing the air filter, it is so loud and I do NOT believe it was that way before. The first repairman agreed that it was NOT supposed to be that loud, so he ordered the replacement part. When it came in a different person came to install it. IT once again made the same loud noise, and he said that is how it is supposed to be. The other appliances (cooktop, oven, etc.) have been OK. I LOVE the dishwasher and exhaust fan, but Electrolux ICON Professional E23CS78HPS is NOT worth what I paid for it.